It was a very bullish week for US equity indexes, with net weekly gains ranging from 2.4% (Trans), 1.0% (sp'500), to 0.8% (NYSE comp'). Near term outlook offers another 1-2% of basic upside. The only issue is when the first correction - since the Nov'/election low of 2083, occurs. The broader outlook remains powerfully bullish, at least to the 2400/500s by late summer. A new historic high of 2300, with the sp' net higher by 23pts (1.0%), settling @ 2292. Underlying MACD (blue bar histogram) cycle is still leaning on the downward side, whilst new highs are still being made. 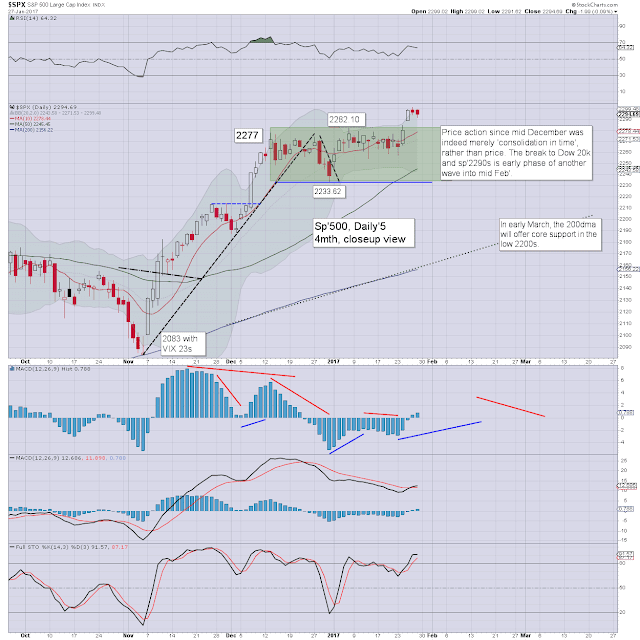 Best guess: a short term top around 2320/30s by mid Feb', and then a retrace of 4-5% into early March. Certainly though, no price action under 2200. The 2400s seem a given by May/June. Keep in mind my year end target of 2683, which I recognise could be seen as 'crazy talk', but if we reach the 2500s by late summer, my target will be on track. 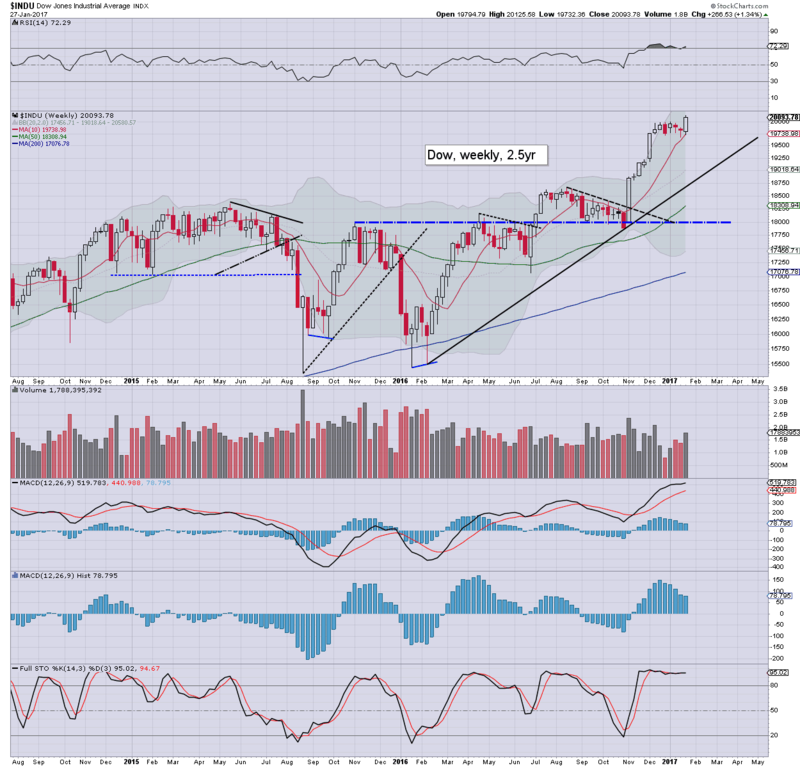 The Nasdaq continues to lead the broader market higher, and saw a net weekly gain of 1.9%, settling at 5660. Just reflect on this... the Nasdaq has climbed 34% since the Feb'2016 low of 4209. 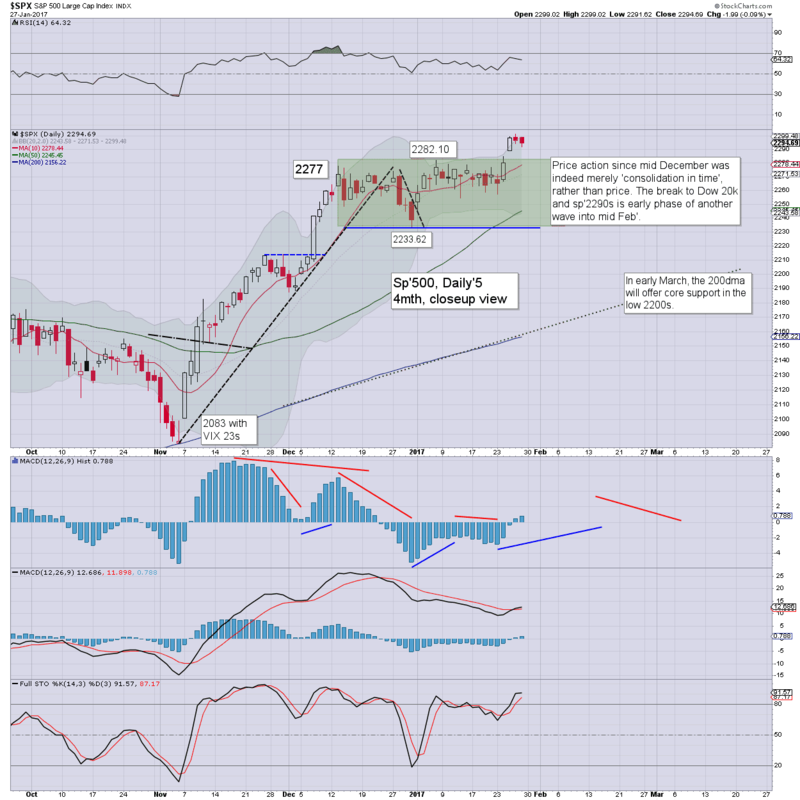 Assuming a minor retrace in Feb/March, at the current rate, we'll see the 6000s by May. Once we're at 6k, its a curious thought that the market could see a 16% washout, and still maintain core support of the 5K threshold. 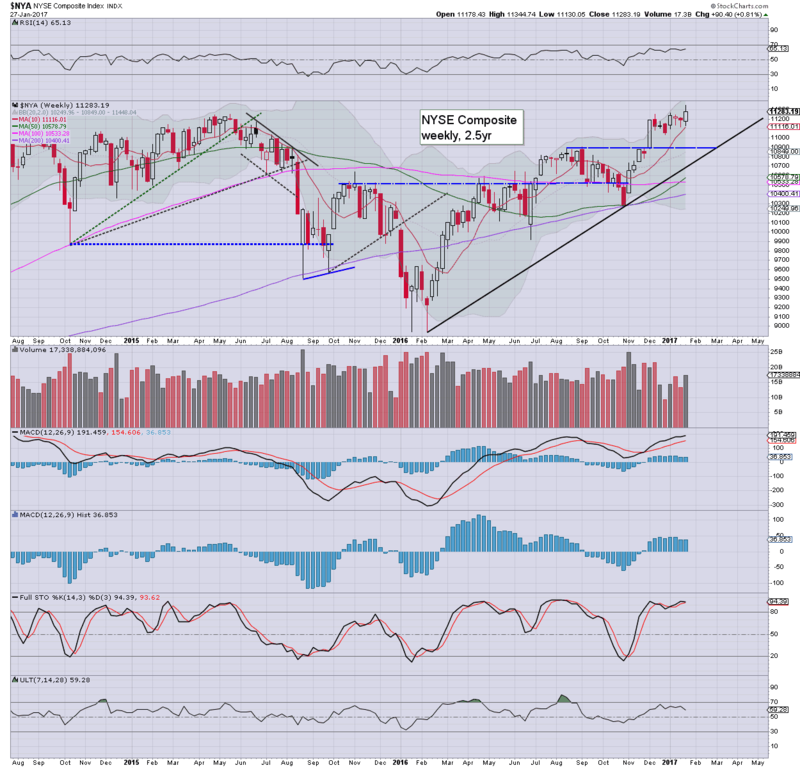 The mighty Dow climbed 266pts (1.3%), breaking a new historic high of 20125, settling at 20093. 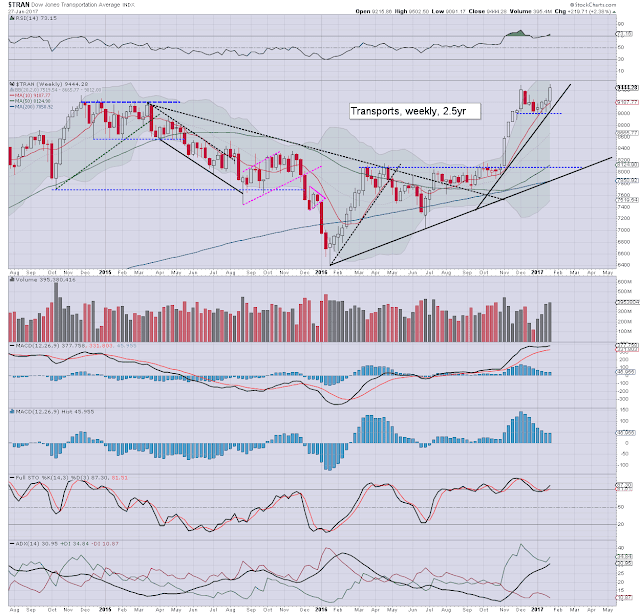 Upper weekly bollinger will be offering the 20600s next week. A valid scenario is that 20k is going to hold as short/mid term support, and if the next retrace will be say... 5%... then we need to first climb to at least 21k, before the next retrace. The master index gained 0.8%, with a new historic high of 11344, settling at 11283. The 12k threshold looks at least 3-4 months away. 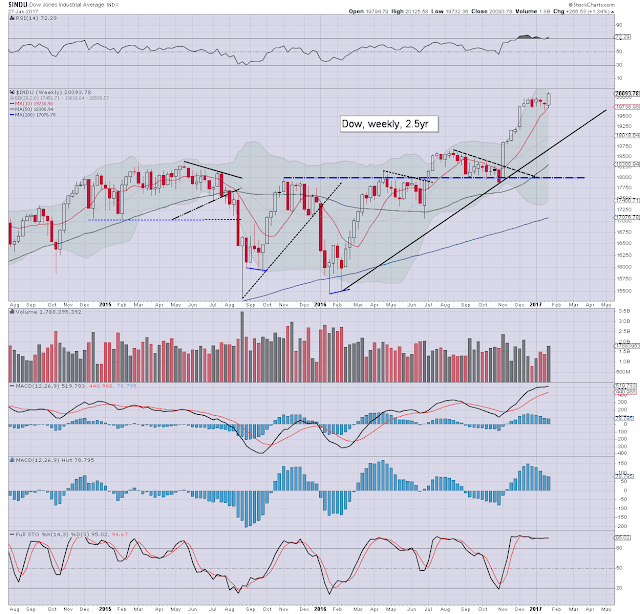 First support is the 11000/10900 zone, which looks secure into the late summer. 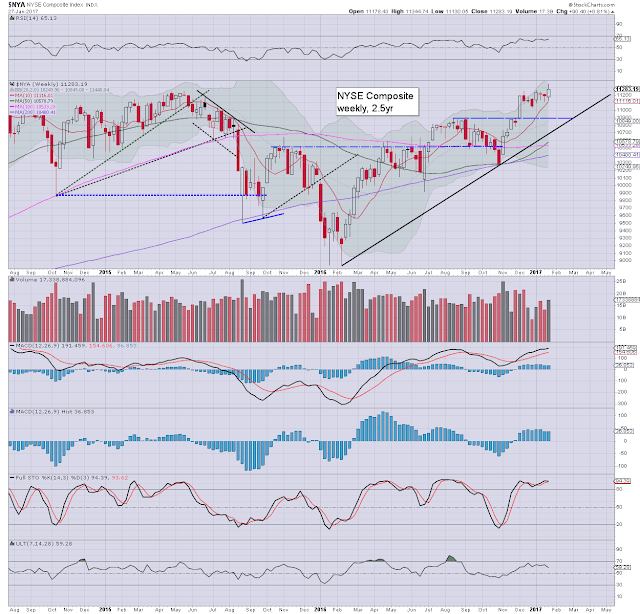 The second market leader - R2K, climbed by a rather significant 1.4%, settling at 1370. 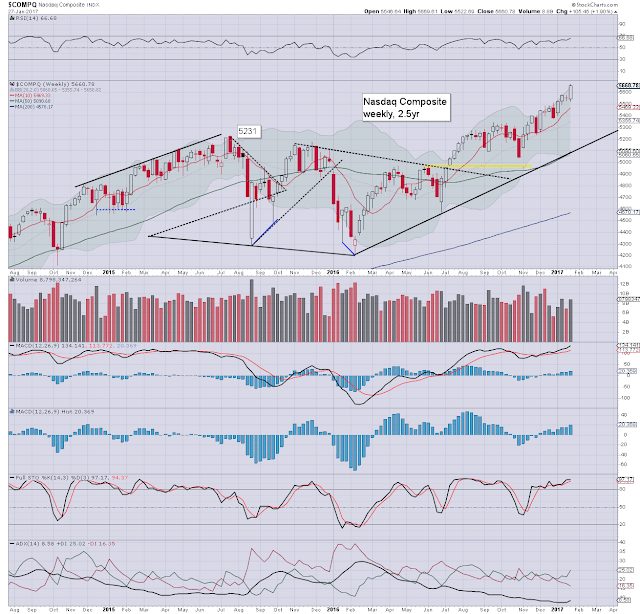 Upper bollinger will be offering the 1440/50s next week... which is a clear 4% higher. The 1500s seem due into the summer. Again, its a curious thought that few (if any) in the mainstream are talking about 'R2K @ 2k', before the current multi-year wave concludes. The 'old leader' - Trans, was the leader this week, breaking a new historic high of 9502, settling with a net gain of 2.4% at 9444. Near term outlook is bullish to the 9700/800s. The 10k threshold looks out of range in the current run from early November. 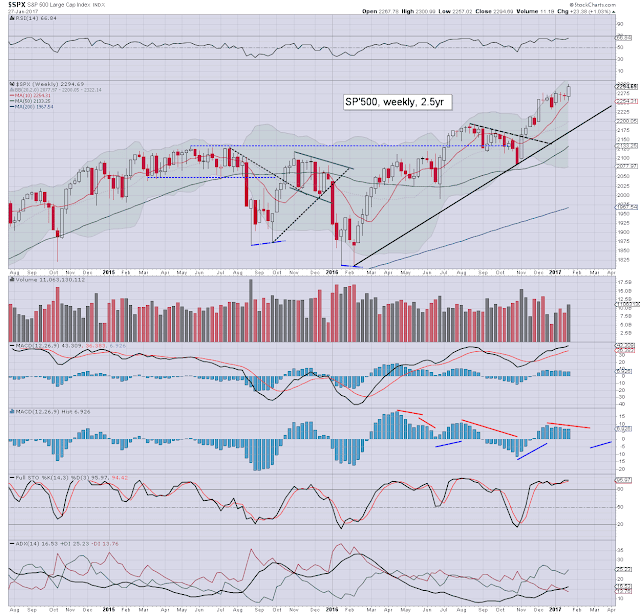 All US equity indexes are broadly bullish, and holding near/at historic highs. The Nasdaq continues to lead the way higher, with the Dow and sp' following. The R2K is a little laggy, but its price structure is a very clear bull flag. Near term outlook is bullish, with another 1-2% of basic upside, before the next realistic opportunity of a 4-5% retrace. notable corp' earnings: Tue': APC, AAPL, XOM, MA. Thurs: AMZN, DB. Fri': HSY, PSX. **FOMC announcement @ 2pm.There will not be a press' conf. No one expects a rate hike, least of all yours truly. I remain expecting three rate hikes this year... May, Sept', and Dec'. *as Tuesday is month end, expect price action to be pretty choppy across the afternoon, not least as the market might be a little twitchy ahead of AAPL earnings. As ever, if you like these posts, you can support me via a monthly subscription. For $20pcm, you'll have access to my continued intraday postings, which total a rather monstrous 220/240 each month. *the next post on this page will likely appear Mon' @ 7pm EST. 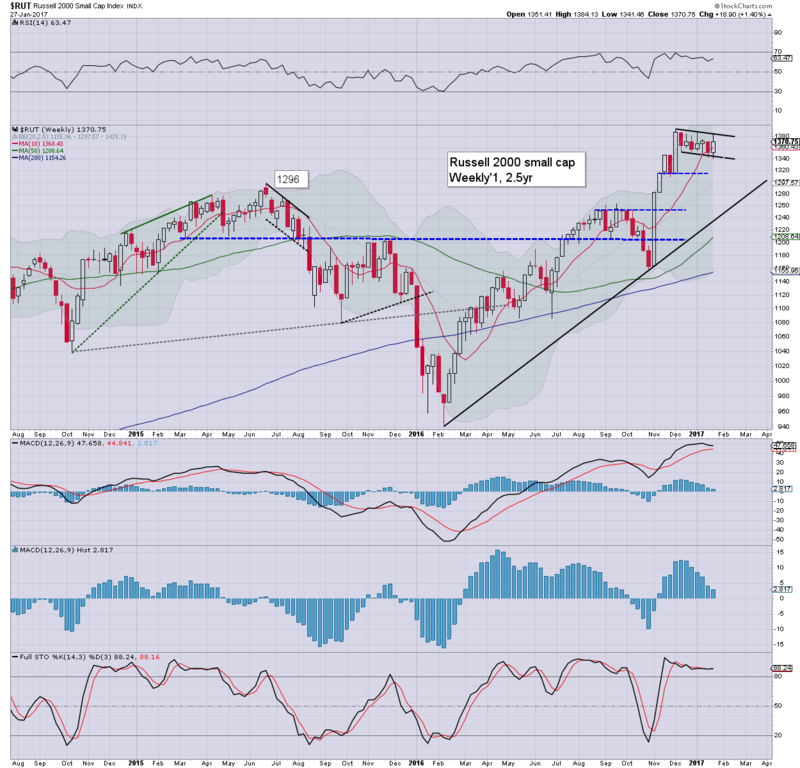 US equities ended the week on a slightly weak note, sp -2pts @ 2294. The two leaders - Trans/R2K, both settled lower by around -0.3%. 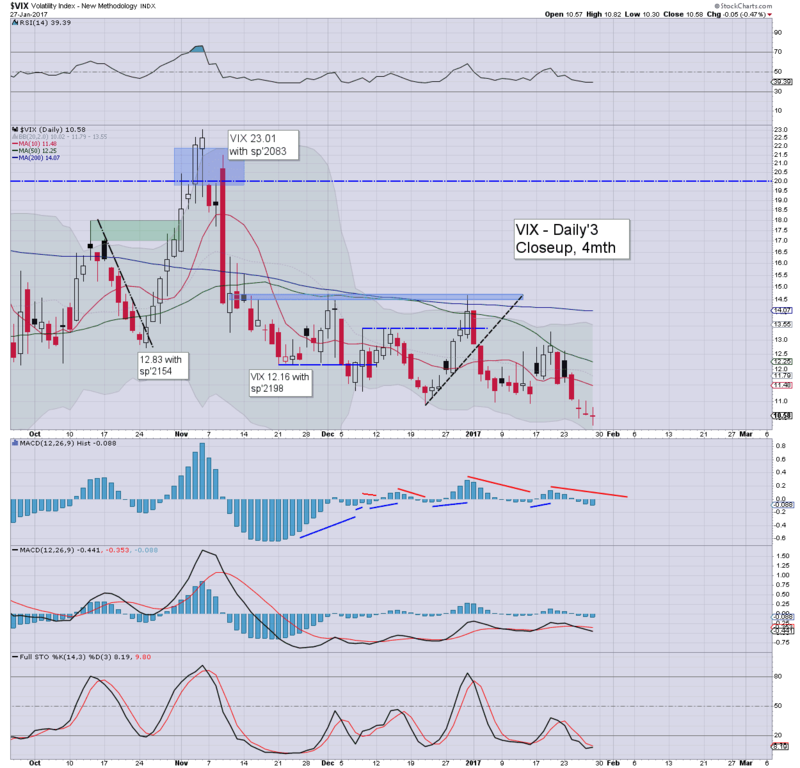 VIX settled -0.5% @ 10.58. 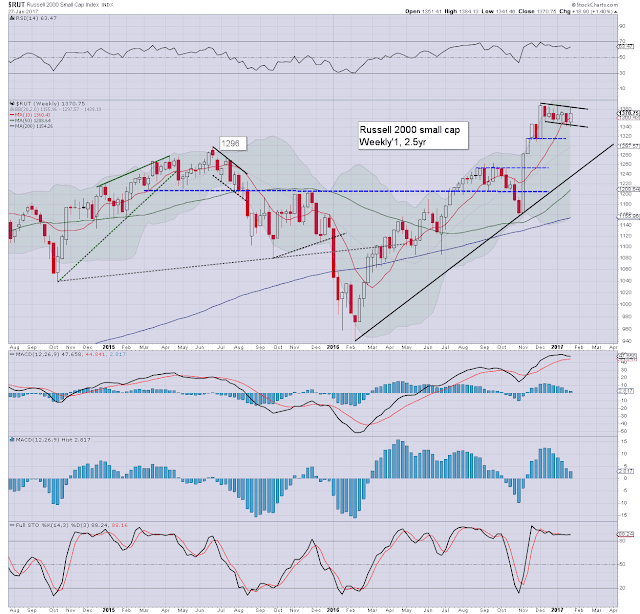 Near term outlook offers further upside to at least the sp'2320/30s by mid Feb'. Despite a great many corp' earnings, and a box of key econ-data, equity price action was subdued across the day. Short term price structure is offering a baby bull flag, with upside to 2305/10 next Mon/Tuesday. Naturally, the VIX was itself subdued, with an intra low of 10.30, the lowest level since summer 2014. 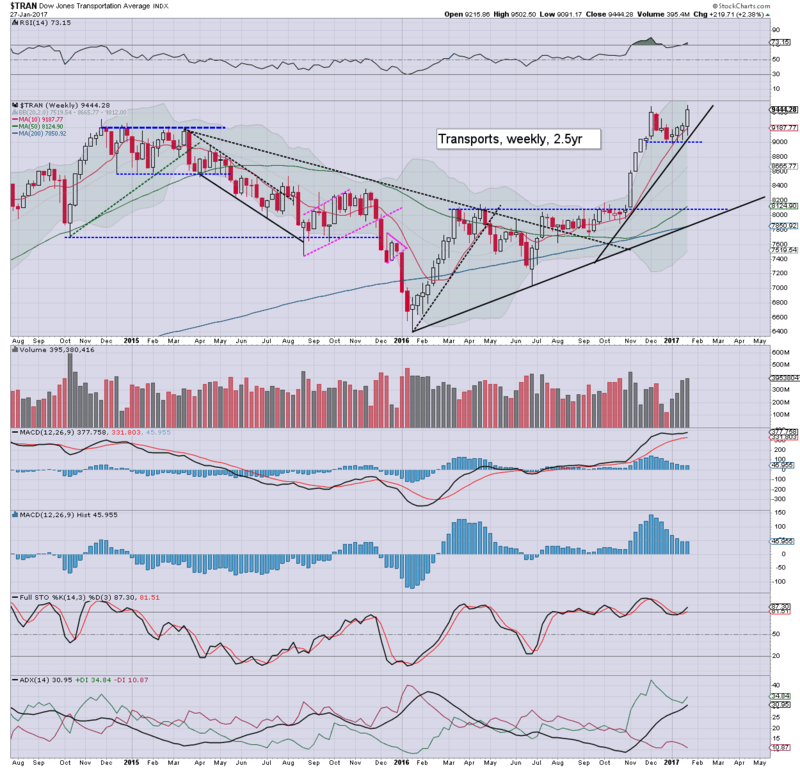 *the weekend post will appear Sat'12pm EST, and will fully detail the US weekly indexes.